This Henry Hathaway directed effort for 20th Century Fox threw me a curveball that proved to be a welcome one at that. 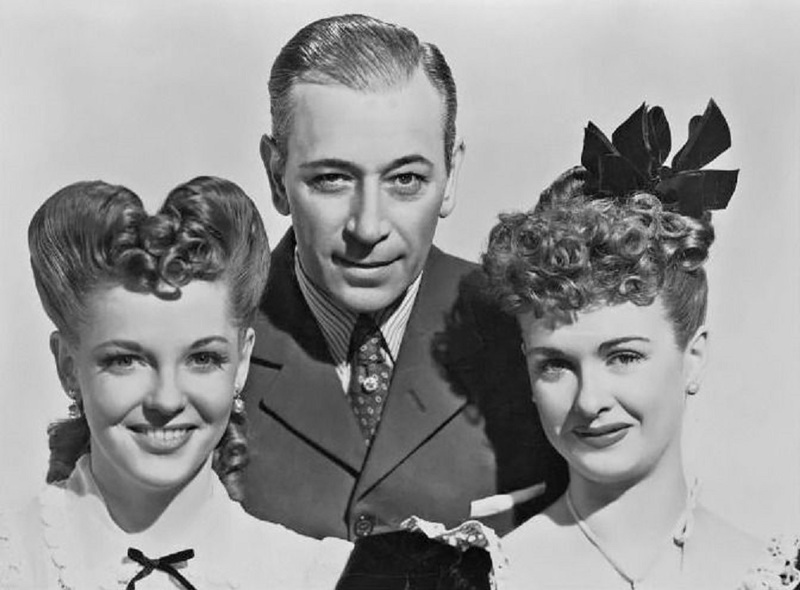 Released on DVD though the Fox made on demand division, I made the assumption that Hathaway plus George Raft equaled action. 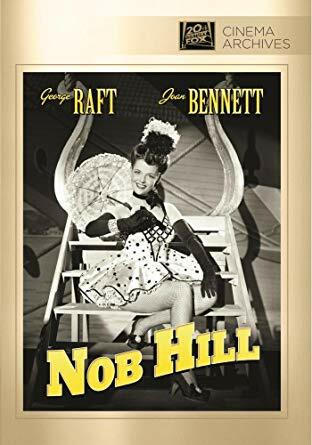 What I got was a Barbary Coast musical that sees Raft as the owner of a swank nightclub on the wrong side of town who falls for the wealthy Joan Bennett who currently resides on Snob Hill. All this while his headliner at the club, Viviane Blaine pines for Raft while singing her heart out on stage. I must say that every dollar spent on this technicolor effort appears on screen from the opening moment forward. San Francisco is a party town and the camera pans the streets of the Barbary Coast before settling into Raft’s nightclub where Miss Blaine takes to the stage singing On San Francisco Bay surrounded by a big dance number. This being Raft’s club and Raft having to appear as the tough guy leads us to a clip where Raft will fire one of his employees for cheating patrons. Not in Raft’s bar! A knife fight ensues that sees our hero unscathed and victorious. Hey look! 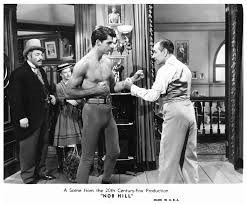 That’s a young Rory Calhoun getting ready to enter a boxing match receiving a few pointers from his manager, Raft. That’s all. Calm down, nothing to see here folks. As a Rory fan I just wanted to point out he’s in here for all of ten seconds and I have to wonder if the fight was filmed. It didn’t make the final cut if it was. 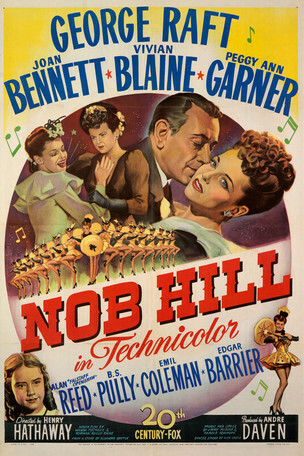 Into our story comes Peggy Ann Garner who film buffs may recall from her other title released the same year as this one. 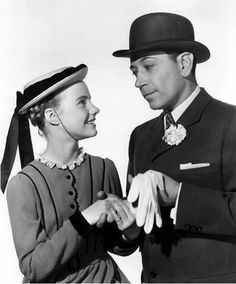 She played Dorothy McGuire’s daughter in the wonderful Kazan film, A Tree Grows In Brooklyn. Here she plays a young lass who has come over from Ireland looking for an Uncle who was employed at Raft’s establishment. Sadly he’s passed on leaving Raft to care for the wee little one. His fathering instincts are going to boil towards the surface as is his interest in Miss Bennett who befriended Garner on the ship that has brought her to San Francisco. Bennett was traveling abroad seeking adventure and now since returning home is looking towards Raft to give it to her. This may be a Hathaway film but if I didn’t know better I’d think John Ford had a hand in this when “too-ra-loo-ra-loo-ral” plays over the soundtrack as little Peggy tells Raft of her homeland in Ireland. It adds a nice sentimental touch to the film that only helped increase my overall enjoyment of it. Into the plot comes an election for the district attorney of San Fran and it’s none other than Joan’s brother running for office played by Edgar Barrier. Could Joan be saddling up to Raft to have him promote her brother in the race to city hall? Not ruining anything here but not only did I expect an action flick, I pretty much expected Joan to be George’s love interest and leading lady in the film when in fact I quickly realized that she’s no good for him and it’s Miss Viviane who I was rooting for throughout to land her man. Fred Flintstones fans will be sure to recognize that familiar voice and why not when Alan Reed is playing one of Raft’s leading hands around the club. You’ll also spot a young Benson Fong as one of the Chinese characters that populate the background of San Francisco. There’s also an amusing scene towards the end when tour gazers are in a Chinatown museum of horrors where young Miss Garner has run off too near the climax of the film. New to me I’d classify this one as a musical at heart with an unlikely Raft as the leading man. Miss Blaine sings her heart out and little Peggy proves to me that A Tree Grows In Brooklyn was no fluke. She’s a very talented youngster when the camera rolls. Truthfully, Nob Hill could really use a restoration but aside from that find a reason that suits you and give this one a look. A Raft fan and I haven’t seen this one.But thanks to your review, I will soon! This one was a bit of a surprise as I basically had prejudged it as a Raft adventure yarn. Nice change of pace. Reblogged this on George Raft Dances.